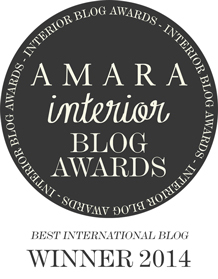 Hello Happy Interior Blog readers. 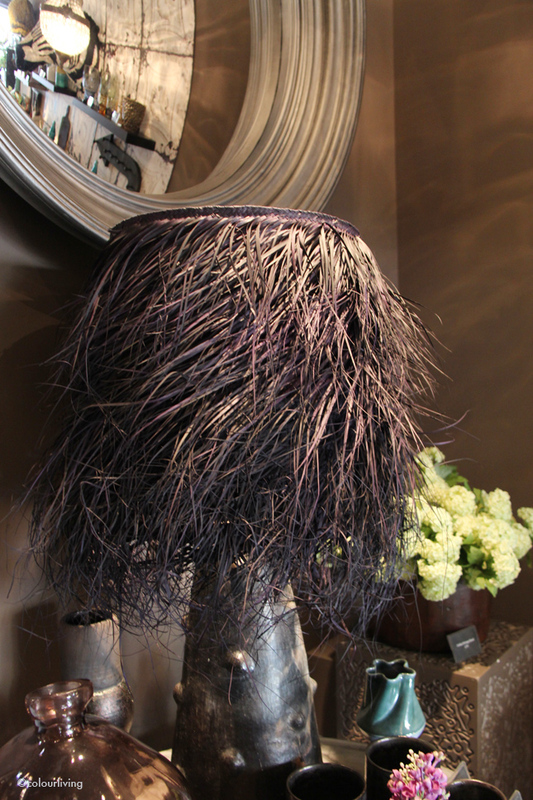 My name is Tina and my blog is called Colourliving. I feel honoured to be here and will try my best to bring you inspiration in Igor’s absence. 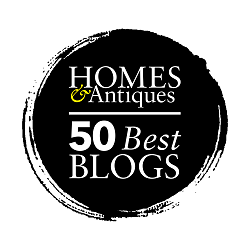 I thought long and hard about what to post here as Igor’s blog in an online encyclopedia for a Happy Home and everything that goes with it. 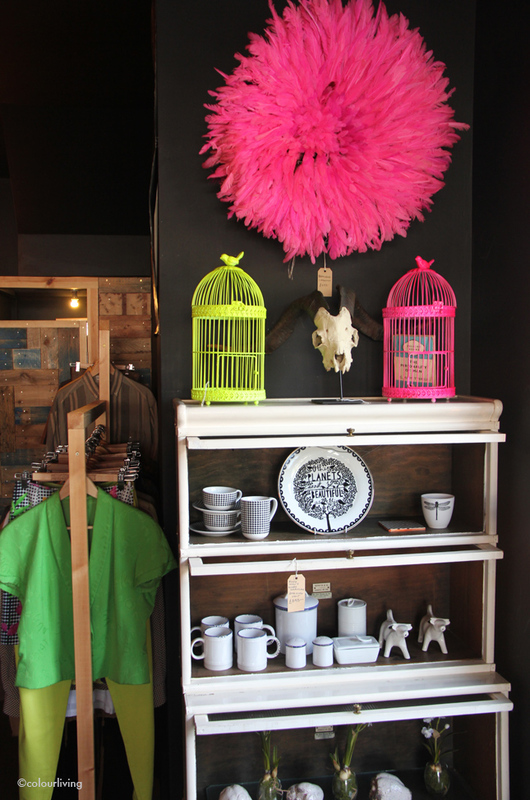 Colourliving embraces colour, creativity, design, interiors, real food and inspired ideas for slow living. 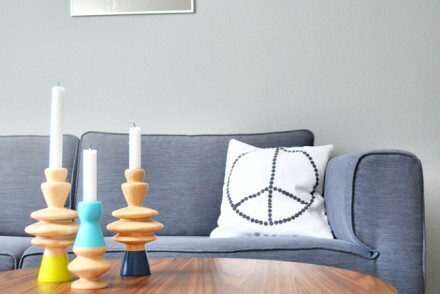 For some time now I was thinking of creating some curated Colourliving lifestyle guides. These guides will be themtic and show ways of creative and inspired lifestyle. To kick things off I tailor-made a little guide here for you dear readers and will be your own personal tour guide:-) Igor and I share a love for colours and for London, so hopefully he will enjoy this too:-). We’re starting out on the famous Kings Road in Southwest London. 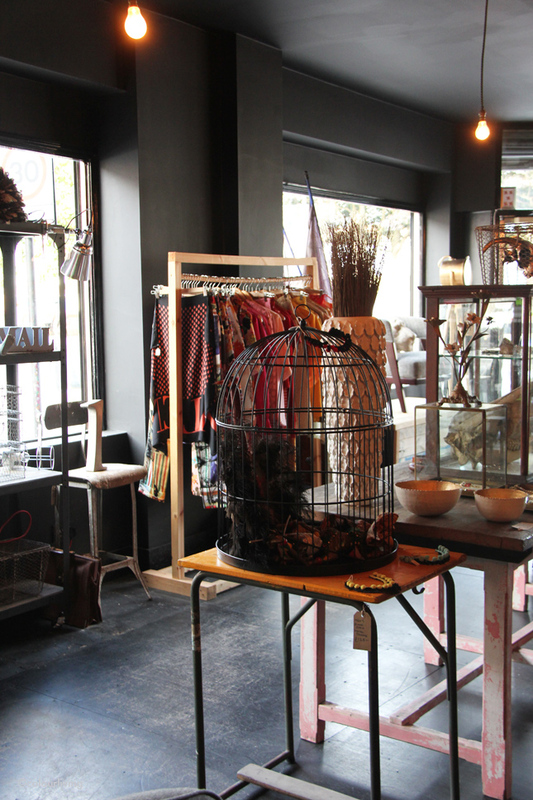 The Shop at Bluebird is an eclectic lifestyle store offering an exceptional edit from the world of fashion, interiors and beauty. It has evolved a lot since it first opened in 2005, and has become very much a destination shop for finding untapped brands and the latest must have items. 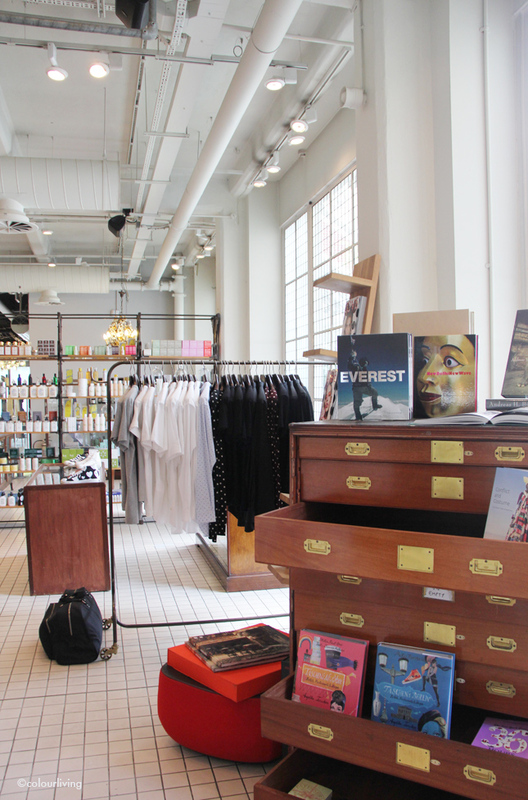 A new concept to the shop is a series of pop-up concessions. I was delighted to see this first one on my visit: YCN is close to my heart and I have blogged about them here. 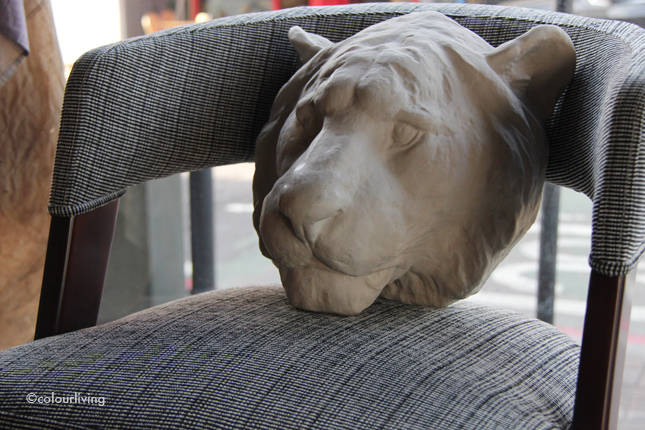 You’ll find many interesting products as well as funky shop displays. 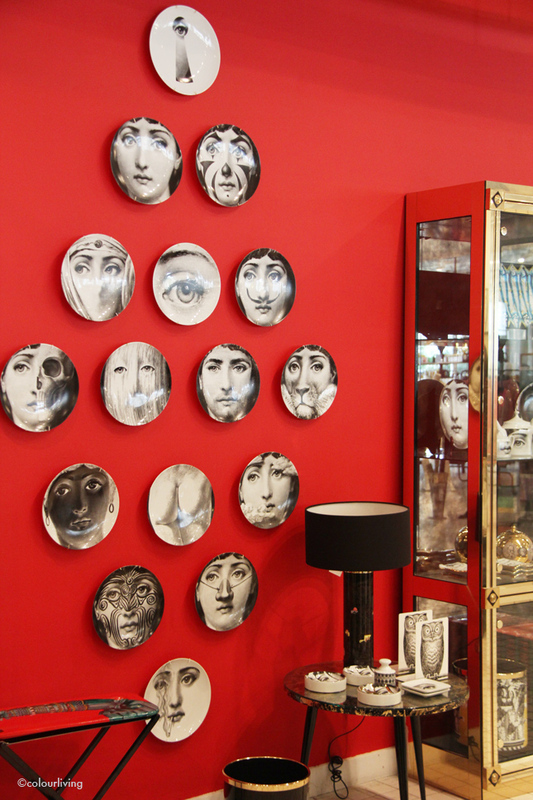 I’m a huge Fornasetti fan and the Shop at Bluebird carries a large range of this most fascinating artist. 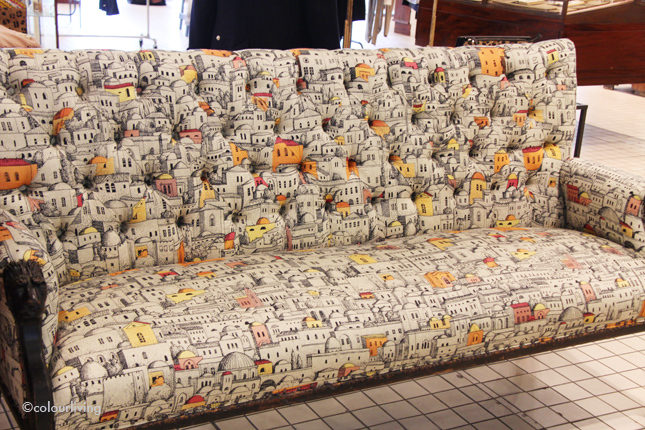 They have a sofa upholstered in one of my favourite fabrics. It’s called Jerusalem by day and I have it as a picture frame hanging in my bedroom. 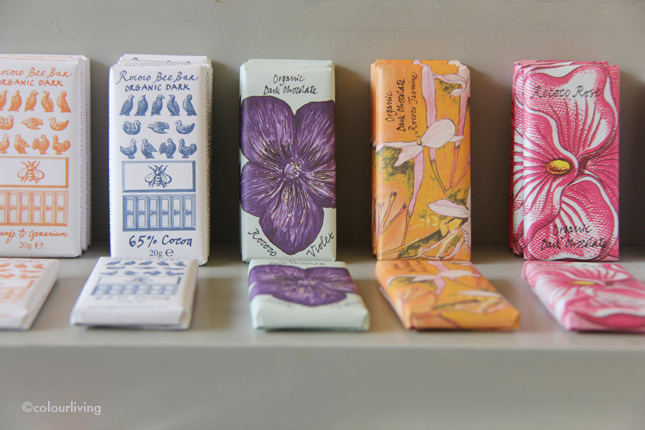 Just opposite you will find the exquisite Rococo Chocolates. This year they’re celebrating 30 years in business and it’s not hard to see why. 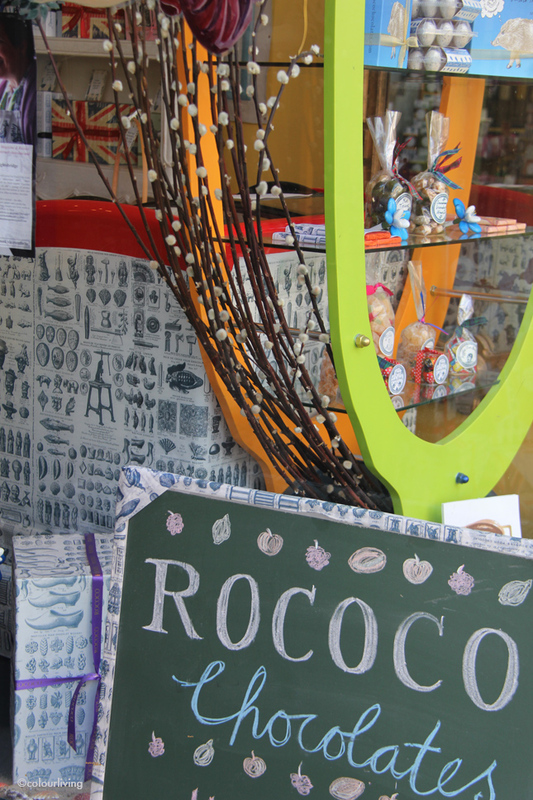 Founded in 1983 by Chantal Coady, Rococo Chocolates is a heaven for chocoholics. 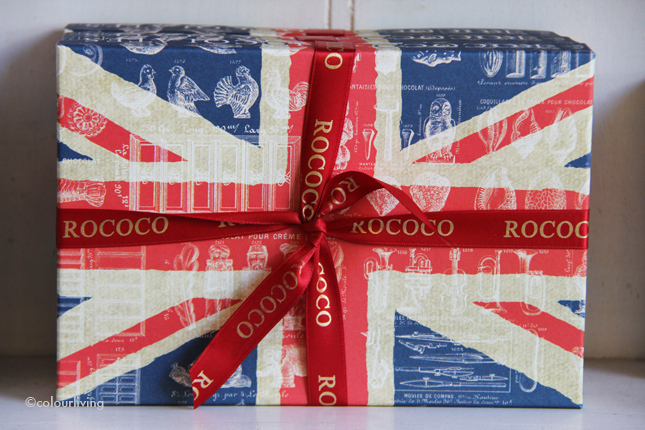 The packaging, the variety of flavours, and the design make Rococo treats highly desireable gifts. You’ll find they’ll use all kinds of combinations like chocolates with flowers, spices, dried fruit and teas with dark, white or milk chocolate. 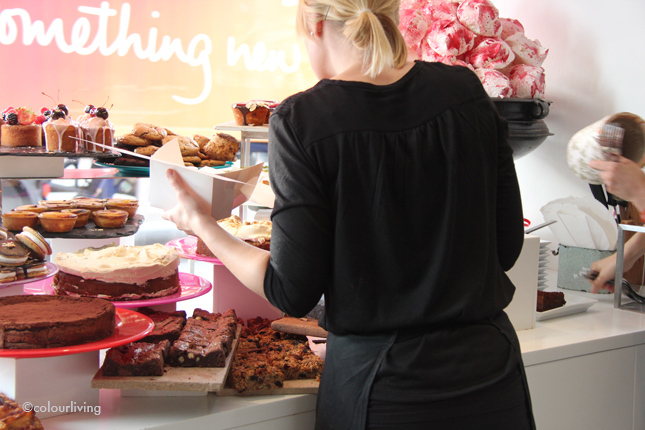 I’m sugar and dairy intolerant but if I want something special, Rococo is certainly the ticket! A few minutes down the road you’ll stumble across an iconic shop that I’ve loved since they first opened many many years ago. 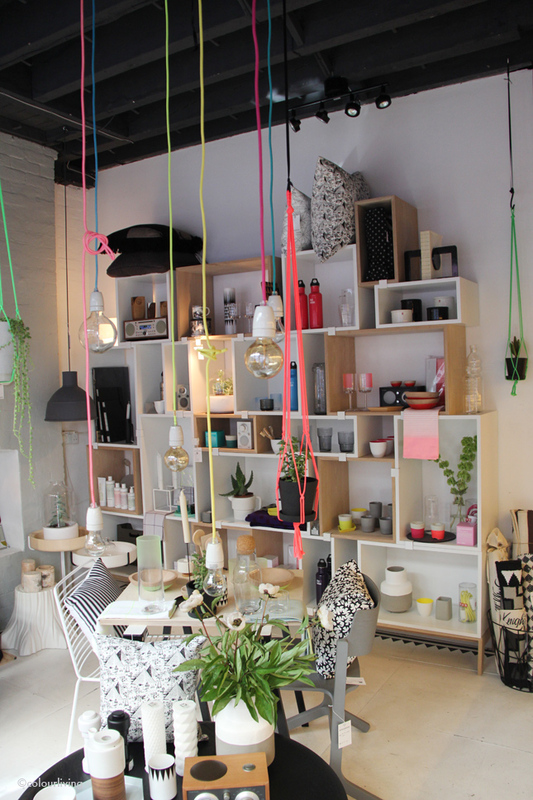 Wild Ones is an Aladdin’s cave of New Age gifts sourced from around the world. 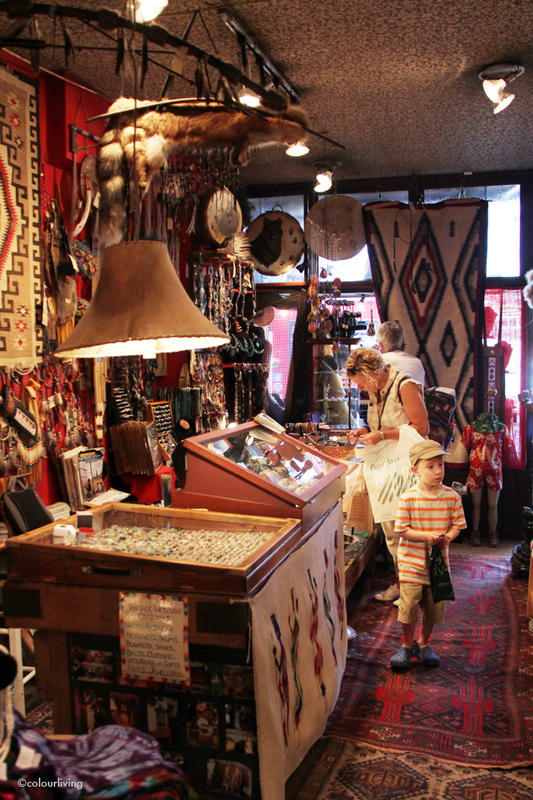 They also have a massive selection of Native American jewellery and artefacts, as well as world music and spiritual books. 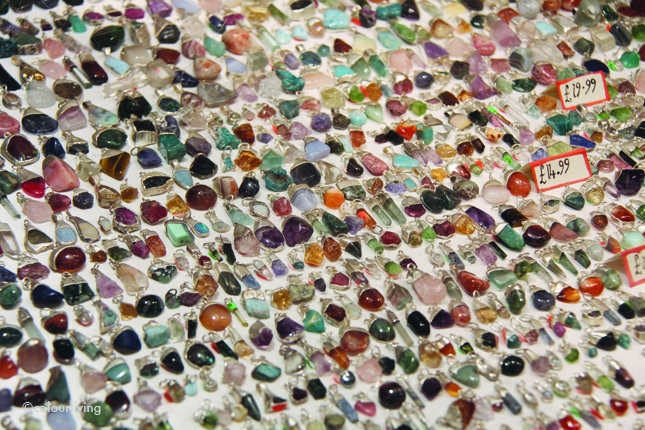 This jewellery is designed and hand made by Michael Van Moppes and each piece is unique. 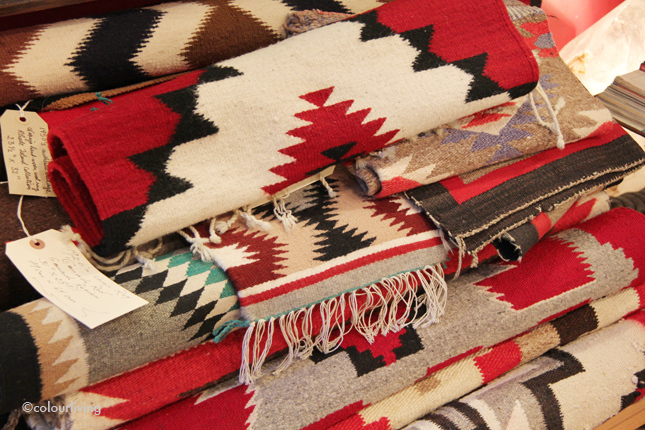 New are the biggest collection anywhere of hand-made Navajo Rugs. They are all one-offs and when they’re gone they’re gone. It seems that the new generation is more interested in computer devices than hand-spinning rugs so it’s a dying craft out there. I must admit they look far better in real life than in the photos online but that goes for a lot of products, right? 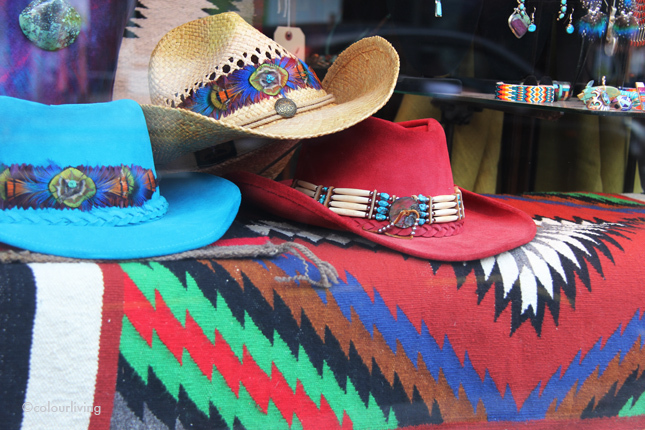 Wild Ones used to be famous for their second-hand native cowboy boots. They no longer sell those. 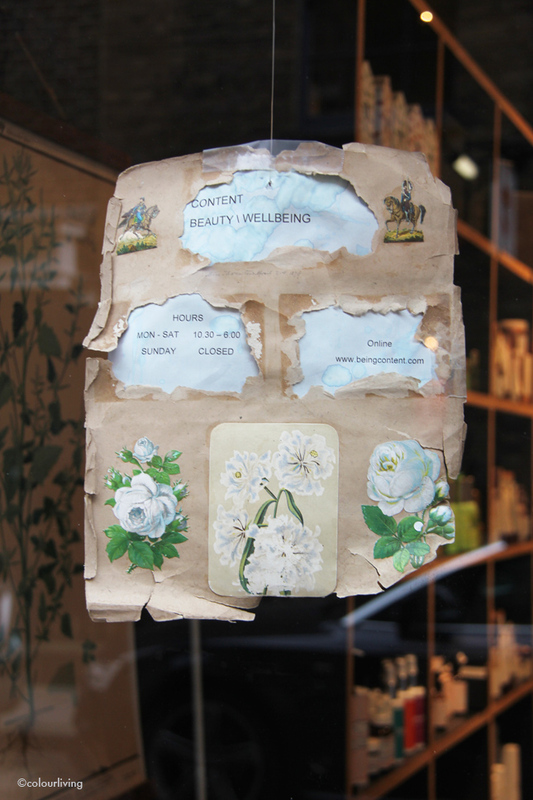 Hopping over to Central London, we’ll make a pitt-stop at Content – an organic and natural apothecary. 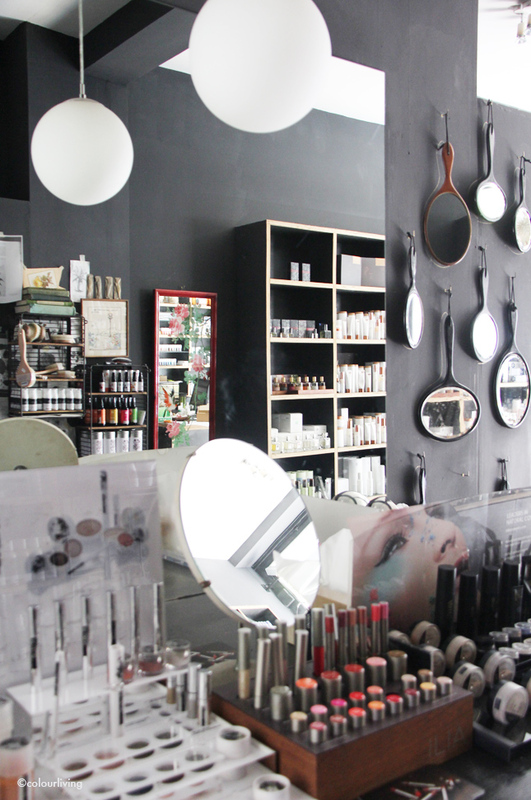 For those of you interested in organic cosmetics and skin care, you won’t find a better place. You can read a far more in-depth interview I did with Imelda, the founder here. 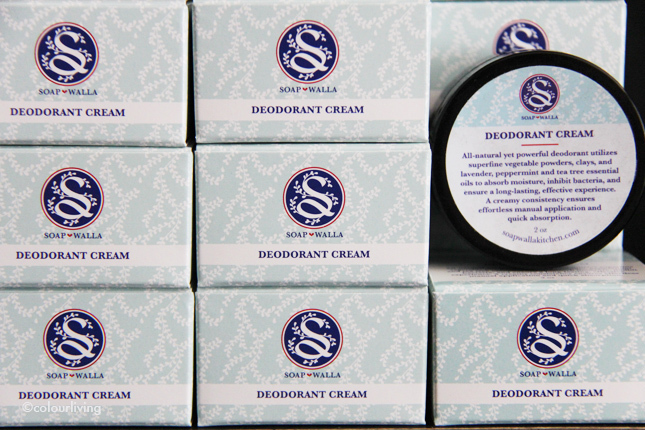 This deodorant is my absolute favourite product and I cannot recommend it enough! Arriving in Hoxton, we pop into the Goodhood store. 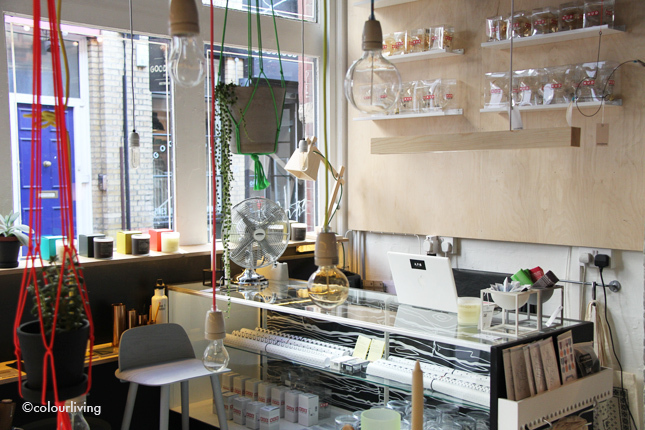 Made up of a lifestyle store and a separate fashion store (directly opposite) it’s another refreshing and welcome addition to truly creative independent retail shops in London. 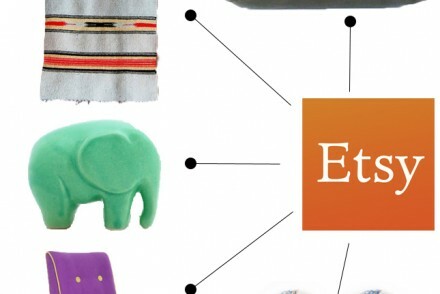 Their product ranges are expertly curated and it’s got more of a feel like one of those enviable Japanese shops, full of clever and well made products. 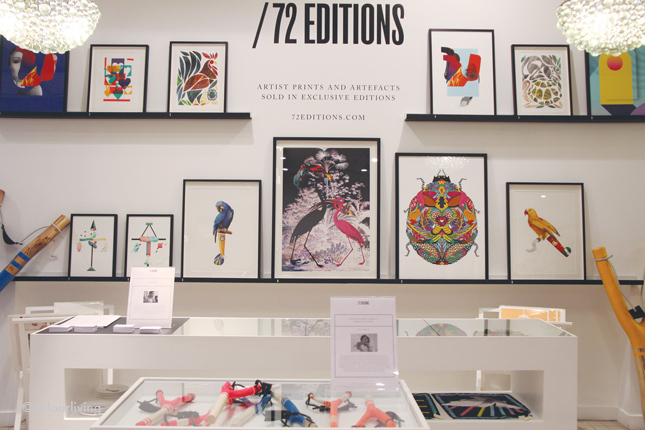 You’ll find everything from mens and womens fashion to accessories, homewares, footwear, divine stationery and much more. 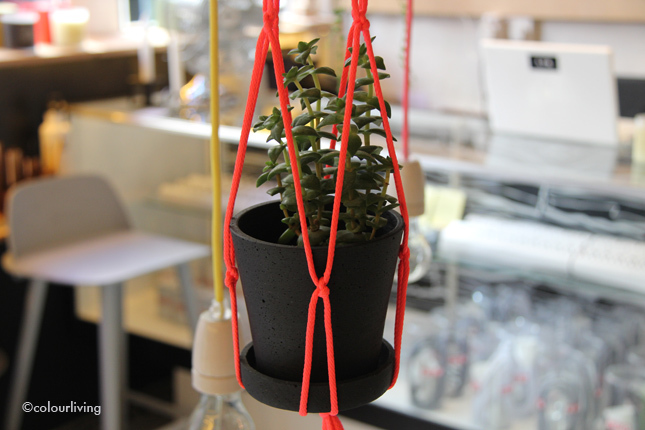 I love these plant hangers. This Log Stool is by the Japanese Collective Gelchop and, apparently, rather difficult to obtain. It’s beautiful but also carries a hefty price tag! Now we’re moving over to the darker side of things:-) We’re off to Stoke Newington and the eclectic Pelicans and Parrots. There are 2 shops, one concentrating heavily on fashion and the other (this one here) sells stylish vintage furniture and ornaments, as well as the odd bit of clothing. Ochuko, who runs this shop has a great eye and it’s not hard to want to buy most things. Painted black, the shop oozes a rather dramatic appearance and makes the wonderful selection of objects and furniture stand out. 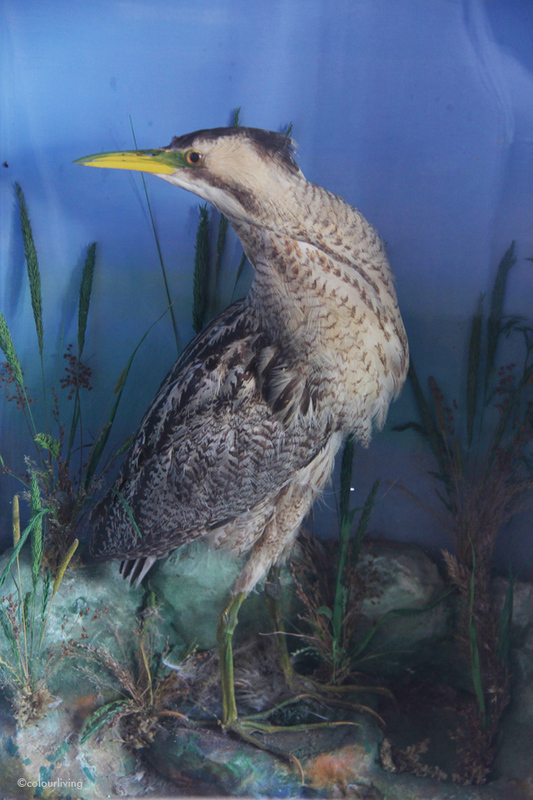 I particularly love all the rather ingenious contextualising by using taxidermy and other artefacts to display and show off products. 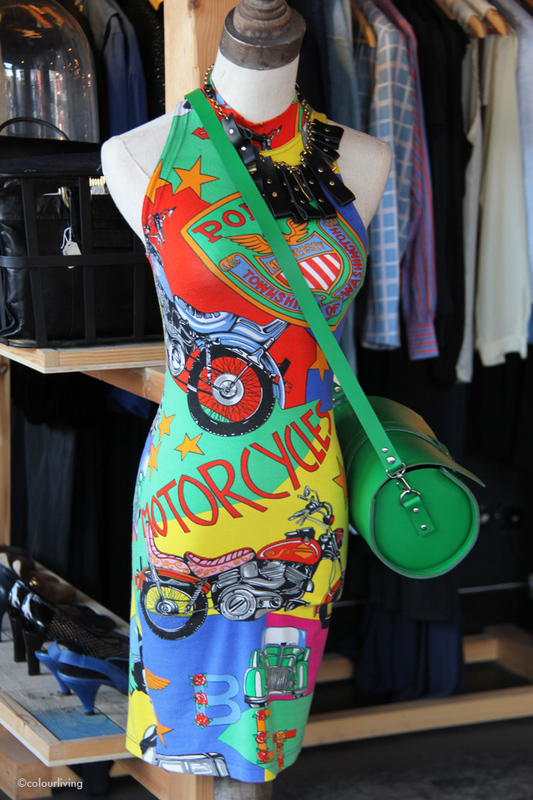 It’s one of those shops that you will return to over and over again and that makes vintage clothes shopping so much more attractive! 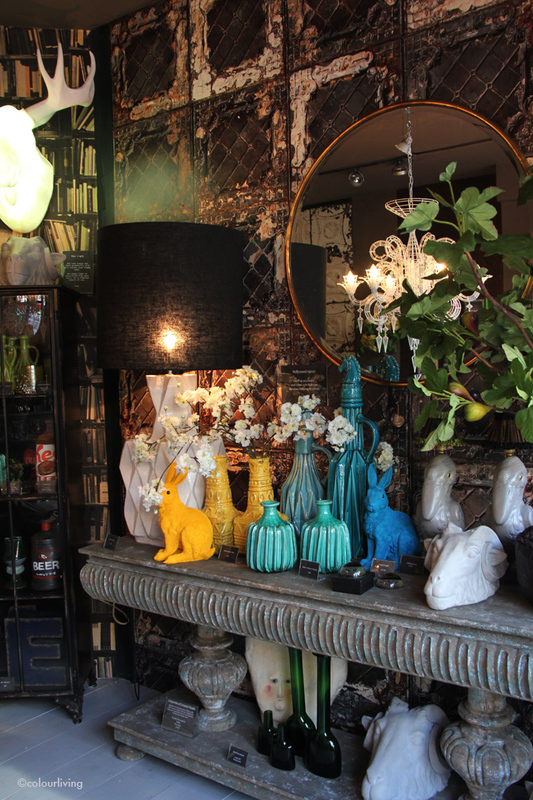 If you’re a lover of ‘making a home’ than you absolutely must visit the fabulous Abigail Ahern and her emporium of seriously gorgeous homewares on Islington’s Upper Street. If you can’t get there, then take a look at her rather ‘yabberish’ but full of wonderful tips and tricks blog. And, if by any chance you fancy becoming the next Ms. Ahern, then attend school, either online or offline (with the design guru herself in her most lavish house). If all else fails, buy her new book, have a cup of tea and indulge in her world! I’m lucky to live a few minutes away from the shop so am a regular visitor. I’m also lucky to have attended one of her classes in her house. Going to the dark side is her thing! Whether it’s your thing or not, what is clear is that Abigail has an incredible style, a great eye for detail and loves sharing her knowledge. Just look at this wonderful lamp. 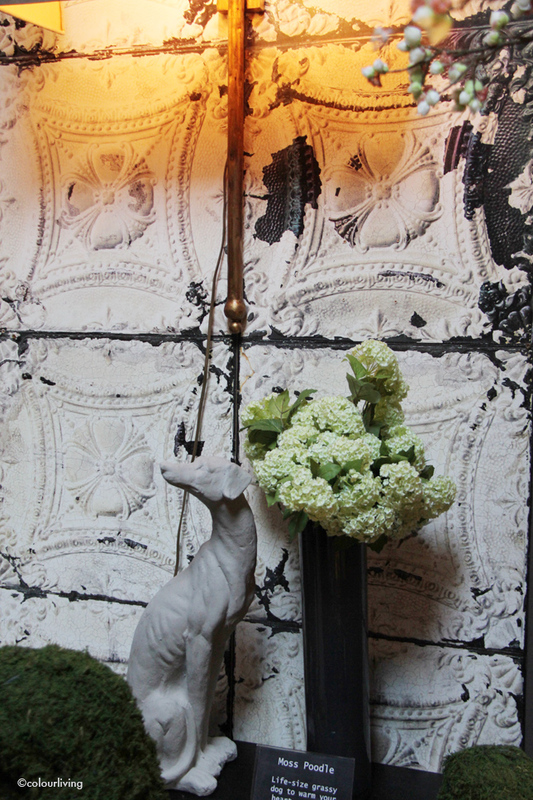 Yep, the tin tiles are actually wallpaper. 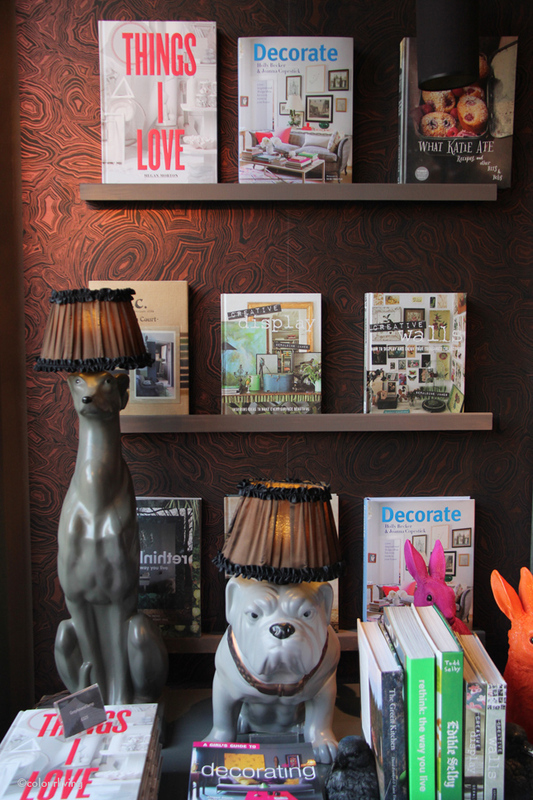 I’ll never tire seeing those animal lamps. If your budget doesn’t stretch to these, Abigail has just launched a more affordable edition range for Debenhams so don’t worry! They ship worldwide. 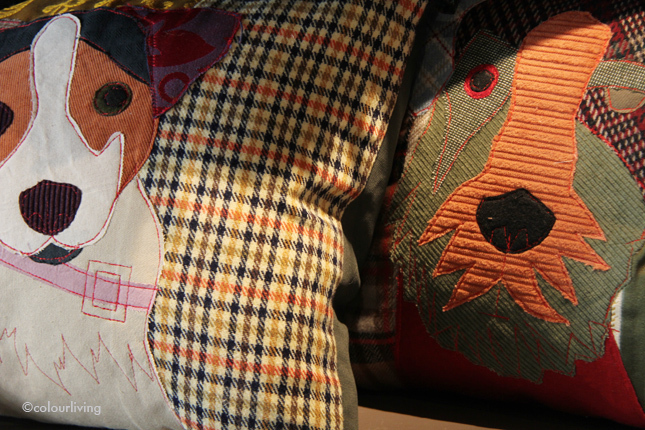 Some fab patchwork dog cushions. I dare you to walk out without buying something. Ok, to round it all up and because by now you’ll be tired and a little broke:-) we’ll nip across the street to the one and only Ottolenghi for a quick snack. Another emporium, but this time it’s food. I’ve been a big fan since the first time I visited the very first one on Ledbury Street back in 2002. Since then, Yoram has gone to super stardom so if you don’t already know this fabulous place that essentially wants to make people happy with good food, take a look and indulge next time you’re in London. You won’t be sorry, I promise. Alternatively, buy all of his books. You will treasure them. Phew, that’s it. We made it. 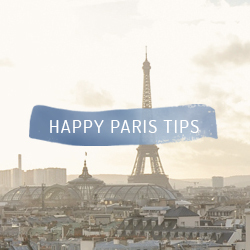 I hope you’ve enjoyed my curated guide and that you found some new inspiration here. I want to thank Igor for inviting me over to his virtual home and am sure he’s having a whole load of inspiration while on vacation. I’d love you to leave comments and let me know which shops you know, would like to visit or simply what has inspired you. I hope we meet again. Bye from London! What a great tour! You’ve gone for such an original slant – and the photos are beautiful too. OMG, OMG, OMG! Bookmarking frantically as we “speak”. I ADORE the Jerusalem By Day fabric, by the way! Love stores like Wilde Ones and I’m always on the lookout for new (to me!) ones so thank you. Goodhood and Pelicans and Parrots are new to me and rather fab. Does anyone not love Abigail Ahern?! I certainly do! I’ve got both her hare and penguin lamps on my wishlist, I recently went to the “dark side” with L’s room and I have her latest book. As for Ottolenghi, I’ve eaten there often and I have their cookbook, Plenty. Darling, Hotel Chocolat? Really? Please try Rococo, it’s on another level all together. You better hurry. Both Hare and Penguin have been bestsellers at Debenhams. You went to the ‘dark side’.. wow! Exciting. Would be magic to Abigail’s ears..
Let’s schedule a Tina & Chi day asap. Igor, you still have to come on the back of the Vespa. 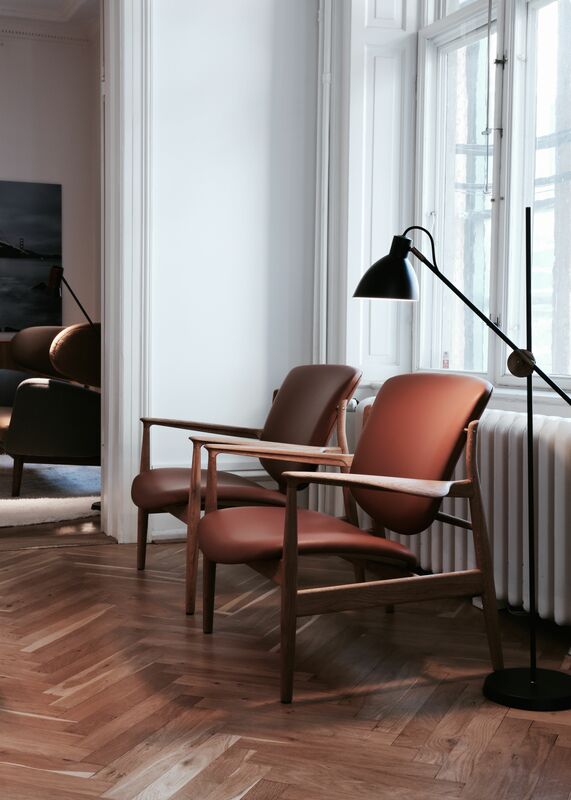 Maybe, just maybe I’ll do an Walnutgrey approved guide, now that’ll be a challenge, don’t you think? Thanks Tina, it was a lovely tour. I love London as well, it’s such an inspiration. Let Igor trust you with this guide. You always have the best taste in shops and laces to eat, I love you for that xox Beautiful post Tina. What a great collection of places and the pictures tell such a nice story. I’m glad to say I have had the personal experience of touring London on the back of Tina’s Vespa and it was magnificent! We went to some fantastic places. So I totally trust Tina when it comes to London 🙂 It is undeniably one of her biggest passions! This post supports that all the way. Thank you very much Igor for hosting me on your happy Blog! 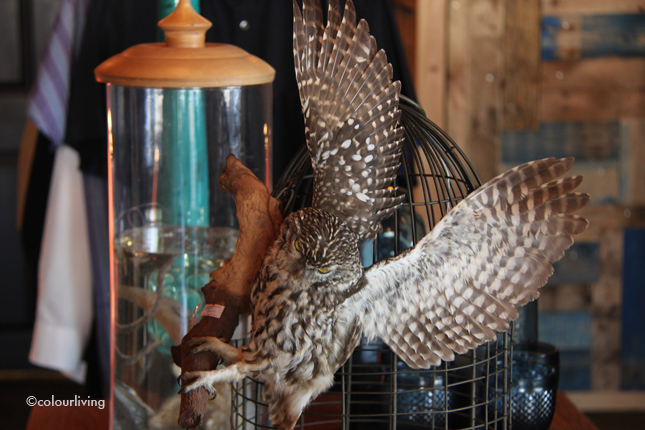 I had a hoot and hope your readers enjoyed my London Lifestyle Guide – thank you all for leaving such nice comments! 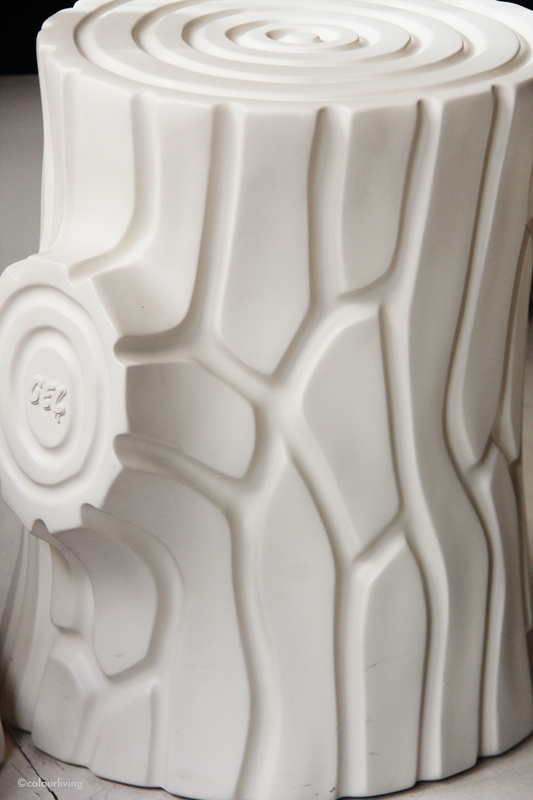 Thank you Chedva… you mean you haven’t been exploring the design-y side of London ?? Haha! Hope you’re well. There is no one better than you to give us a Lifestyle Shopping Tour of London. 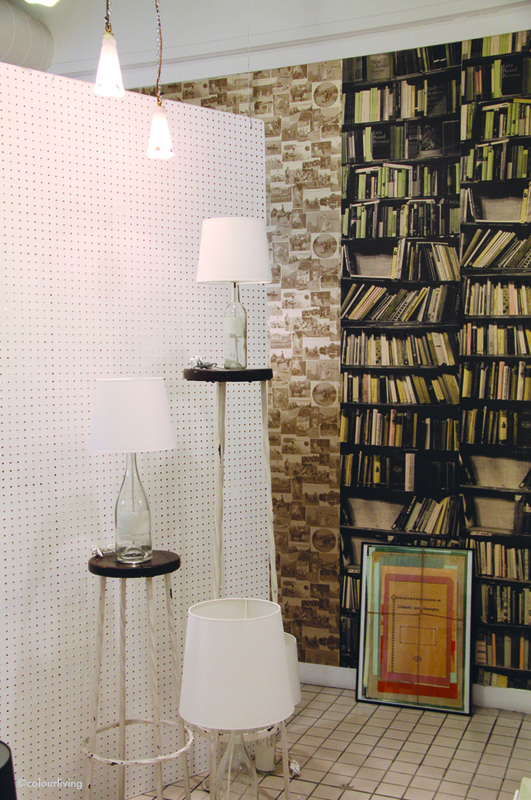 My heart skipped a beat at Abigail Ahern’s store (the lamp and the tin tiled wallpaper) swoon!!! 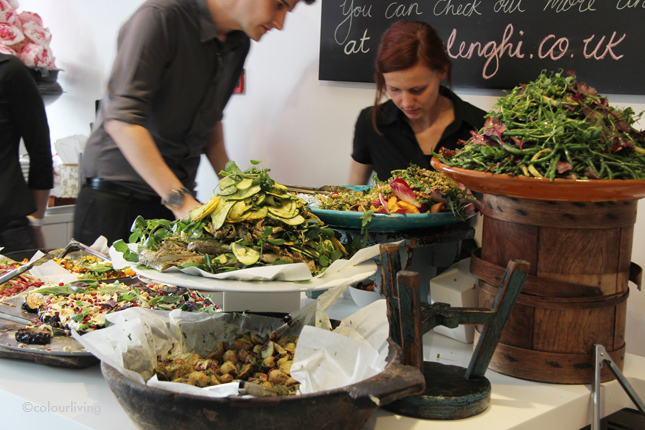 Also Ottolenghi’s, I die, love his food, the way he displays it and the vibe of the store. Thanks for the inspiration Tina. Hope to visit all of these places one day. I really like the great colorful sofa! I would like to have it in my apartment! Thanks for lovely tour!! This post reminded me of amazing memories I had in London… Your post has shown life in London that is unforgettable.Cheers!! 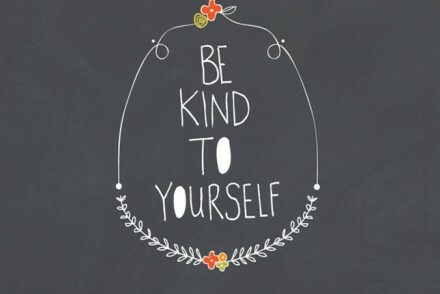 Upcoming London event ‘Invest in You’ is sure to be an enjoyable and informative day for all. Guests can gain an insight into balancing work and play, marketing their brand, fitness and much more. shopping experience, a personal shopping session as well as a host of other goodies; it’s a raffle not to be missed.